LEBANON, OHIO, USA - OCTOBER 12, 2018: President Donald Trump states "I got the great state of Ohio" at a rally at the Warren County Fairgrounds in Ohio. hd00:54LEBANON, OHIO, USA - OCTOBER 12, 2018: President Donald Trump calls Democrats "These are bad people" at a rally at the Warren County Fairgrounds in Ohio. hd00:20LEBANON, OHIO, USA - OCTOBER 12, 2018: President Donald Trump describes that he may have up to four supreme court opportunities at a rally at the Warren County Fairgrounds in Ohio. hd00:55LEBANON, OHIO, USA - OCTOBER 12, 2018: President Donald Trump describes swearing in Justice Brett Kavanaugh at a rally at the Warren County Fairgrounds in Ohio. hd00:40LEBANON, OHIO, USA - OCTOBER 12, 2018: President Donald Trump states "You finally have a president..." at a rally at the Warren County Fairgrounds in Ohio. 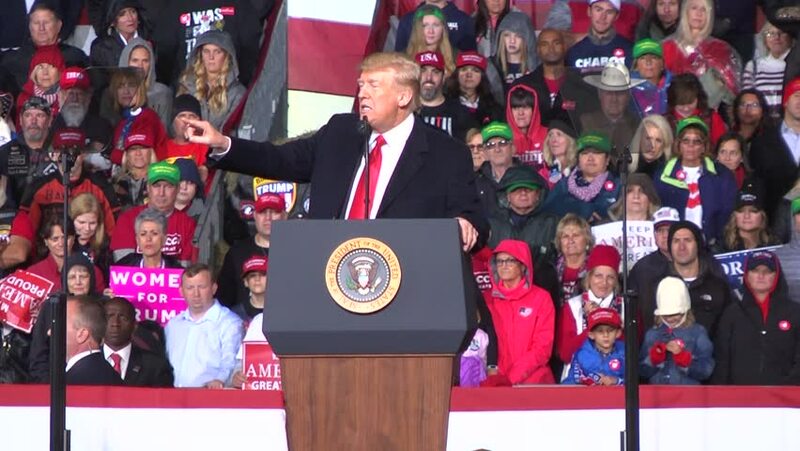 hd00:29LEBANON, OHIO, USA - OCTOBER 12, 2018: President Donald Trump states "A vote for Republicans..." at a rally at the Warren County Fairgrounds in Ohio. hd00:54LEBANON, OHIO, USA - OCTOBER 12, 2018: President Donald Trump states "If Nancy Pelosi and the democrats take control..." at a rally at the Warren County Fairgrounds in Ohio. hd00:29LEBANON, OHIO, USA - OCTOBER 12, 2018: President Donald Trump and supporters (chanting USA USA) at a rally at the Warren County Fairgrounds in Ohio. hd00:11LEBANON, OHIO, USA - OCTOBER 12, 2018: President Donald Trump states "The fake news didn't want to write about it" at a rally at the Warren County Fairgrounds in Ohio.